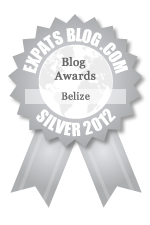 ExpatsBlog.com Expat Blog Awards 2012: Belize Silver Award! This blog won the Silver Award for best expat blog in Belize! It is interesting to read Carrie's blog. She is working to carve out a lifestyle that many of us dream about. I love Carrie's blog...love learning about the mainland and her travels in Belize. Keep up the great work! I love Carrie's blog. She tells so much about her life on the mainland, and since I have only been to AC, it is great to get more info about life in different parts of Belize. Plus, her photos are wonderful, and I love seeing what she wants to show of her life there. I am going to move to Belize next yr if I can get everything worked out. It seems like a big step. How did you start out and get a visa? Which island do you live on? I am thinking about Caye Caulker.